Daily Illuminator: Announcing Munchkin Love Shark Baby! August 16, 2014: Announcing Munchkin Love Shark Baby! Love is a many-splendored thing. So is loot. And we love loot. So you know what we did? We asked Katie Cook to help us make a Valentine's Day-themed booster pack for Munchkin, and the result is Munchkin Love Shark Baby. With Katie's fantastic art and our . . . fantastic? . . . puns, we're making a love-themed booster dripping with cuteness and romance. Also killing things and taking their stuff. 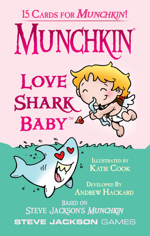 Munchkin Love Shark Baby is due out January 2015.